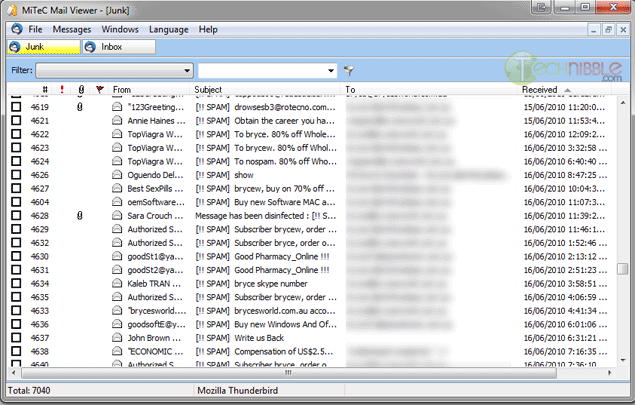 Mail Viewer is a free and portable application to view standalone Outlook Express, Windows Live Mail and Thunderbird databases. By standalone, I mean it will display a list of the emails contained in the databases without actually setting up the email client the file belongs to. Mail Viewer allows you to view most of what you can in an ordinary email client such as view single emails, attachments and HTML preview. It also features powerful search and filtering capabilities to find specific emails inside the databases. I recently used this application when my father needed to reference an old email from 2007. We always keep backups but it was around this time he migrated from Outlook Express to Mozilla Thunderbird, so I wasn’t sure which database this email from 2007 was in. I also had backups of the backups from various periods so I had to look in many different backup versions to find it. While it isnt too hard to setup the old database in the new application, it would have been quite time consuming to search through all of the old backup versions. Mail Viewer was perfect for this situation and is definitely worth adding to your toolkit. Mail Viewer is free for both private and commercial users. Utilman.exe is a built in Windows application that is designed to allow the user to configure Accessibility options such as the Magnifier, High Contrast Theme, Narrator and On Screen Keyboard before they log onto the system. This was designed to help people who are hard of sight, hearing or mobility to log onto Windows themselves without the need of outside help. Its a great feature for disabled people but it opens up a security hole that we can take advantage of to bypass Windows logons. Bypassing the Windows logon comes in handy if our clients have forgotten their logon password, their user profiles were corrupted or malware was interfering with the system before login. This works because the user can trigger Utilman by pressing Windows Key + U before Windows logon. This will load up the Utilman.exe executable which resides in the Windows\System32 directory. If you swap the Utilman.exe file with something else like cmd.exe, you have access to the command prompt running SYSTEM privileges. SYSTEM is an account with the highest possible privileges on Windows which similar to the root account on Unix systems. Here are the step by step instruction on how to do this. You can do a lot of damage to a system if you dont know what you are doing. Technibble accepts no responsibility if something goes wrong. 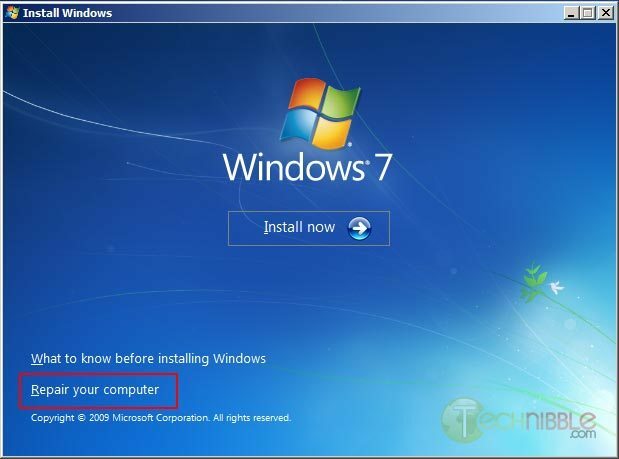 In this example we will be using the Windows 7 DVD. To begin, boot from your Windows 7 DVD and when you reach the first screen asking about the language, currency and keyboard format, Click Next. On the next page, down in the lower left hand side, click on the “Repair your computer” link. 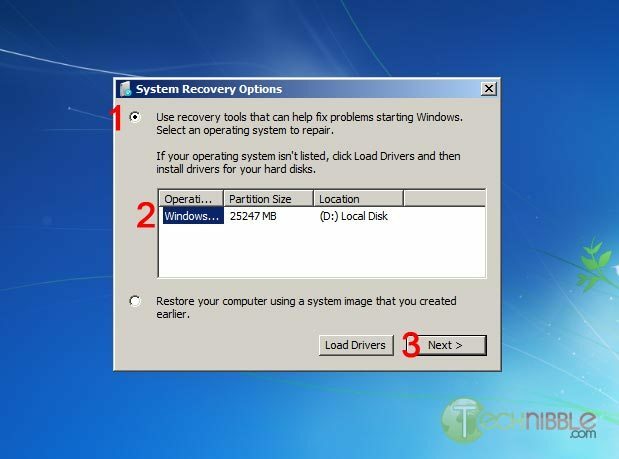 Next, select the “Use recovery tools that can help fix problems starting Windows. Select an operating system to repair” option, choose an operating system from the list and Click Next. You will now have an option to “Choose a recovery tool”. Select Command Prompt. This will navigate to the system32 directory, rename utilman.exe to utilman.exe.bak, make a copy of cmd.exe and name it utilman.exe. Remove the DVD and reboot the system. Once the computer boots up normally, press the key combination Windows Key + U and you should get a Command Prompt. If the Command Prompt doesnt appear, press Alt+Tab as the Command Prompt may appear behind the Logon screen. From here, you can run many (if not all) of the commands you can normally use in Command Prompt. If you reset a users account password. This will permanently lose access to the users encrypted files. Be sure to back these up. To reset an existing users password, we need type the text below. In this example, we will be changing JohnDoe’s password to “hunter2″. You should be able to log in with this new password straight away. Again, you should be able to login straight away with this new account. Thanks to MobileTechie for mentioning this trick. The iPad is a great device for computer technicians to carry around while out in the field. It’s a small and portable, yet powerful machine capable of assisting computer technicians with their work. Here are just four ways that computer techs can take advantage of Apple’s tablet. A great iPad app that’s specifically targeted towards computer technicians is called iFix. It’s an app that aims to ensure that repair orders and client data stay organized and can be easily and quickly accessed. You’re able to add specific information about each client including info about their computer, a list of their service orders, status of said service orders, and a history of past repairs for each client. The app also has a handy search feature where you can quickly look up a specific client or bit of information in a very short amount of time. Essentially, every text field in the app is searchable. The only drawback of iFix is multi-user support and the lack of database backup options. The developer said that these features are being worked, but that was a year ago, so just be aware of this if these features are important to you. If iFix isn’t measuring up to your needs, an alternative is an app called mHelpdesk. It accomplishes some of the same features that iFix achieves and it can even schedule and sync appointments with your Google Calendar, as well as the ability to create and email invoices in PDF format. It even has a pretty comprehensive billing system of sorts that allows you to create estimates, email invoices, and record payments. CommitCRM is another great piece of software geared toward computer technicians that keeps track of clients. While it doesn’t have a dedicated app for iPad, it has a feature-packed web interface that can be accessed through the web browser on the iPad. Just like other popular CRMs, CommitCRM is widely-used, so the community support is undeniable. However, it’s not free (or cheap), but a 30-day trial is available for anyone who wants to give it a try before diving deep. The iPad is a great device to use as a register of sorts that you can use to accept credit card payments. You can hook up a Square credit card reader to it and begin taking credit card payments from clients right away. It’s an easier – and possibly cheaper option than having to open up a merchant account at a bank and purchase bulky processing equipment. There’s no cost to get started using Square – just a small transaction fee of 2.75% for every swipe. If Square specifically doesn’t seem like your cup of tea, other options for easily accepting credit card payments via an iOS or Android device include PayPal Here and Intuit’s GoPayment, both of which have awesome competing features. There are many remote support applications available. LogMeIn Ignition is just one option that’s wildly popular, but I find TeamViewer’s iPad app to be dead-easy to use. You simply enter in the TeamViewer ID and password for the computer you want to access and you’re controlling the desktop remotely within seconds. And just in the case the client is rather computer-illiterate, installing TeamViewer on a client’s machine is very simple and doesn’t involve multiple, confusing steps. They even have a standalone version that can simply be launched right after being downloaded — no installation required. Something that we all kind of loathe nowadays is doing inventory. However, the Computer Inventory iPad app can makes things a little easier. It allows you to manage your entire business’s inventory all the way down to what software is installed on which computers. It can also act as a more minimalistic CRM of sorts — being able to keep track of the type of machine a client has, as well as what software they have installed, that way you don’t have to keep asking them every time they report a problem to you. The app also allows you to export your lists to XML and email formats to send and store them accordingly. Are you using an iPad app in your computer business that we didnt mention here? Let us know! Drop us a comment.